Para/Site organizes exhibition for local young artists every year. When considering the form of the exhibition, curators of the exhibition, decided to exchange roles between curators and artists and ask the artists to tell curators what to do. Hector, one of the curators was disappointed that the exhibition just repeats the traditional mode of art exhibition, very sterile and object-driven. Then the artists replaced their works by marks and photographs of the show on original spots after the exhibition opening. 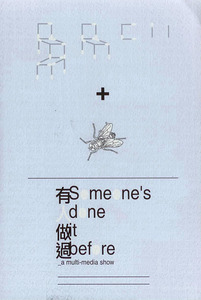 In response to Michael Cheng’s work, a member of the audience, May Chan, created and presented her own work in the show. On the last day of the exhibition, the artists told audience that the exhibition start at the window. When audience entered the window space, they were locked for while and became performer as artists looked at them outside the window. Artists, curators, performers and audience became indistinguishable from each other and exchanged their roles naturally.